Partial albino Swift finds a mate? A rare morning of calm weather and the sky was full of Swifts again. 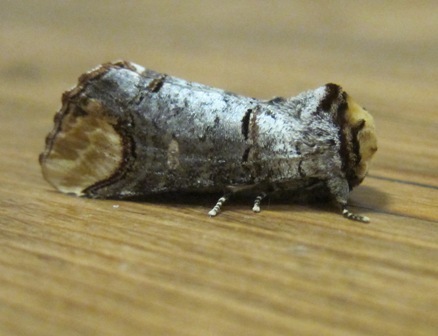 Our unusually marked partial albino Swift found a potential mate and succeeded in attracting it back to nest box 3. They spent an hour there this morning, calling softly to one another. I now think that the partial albino bird is a female based on the calls I have heard it make. 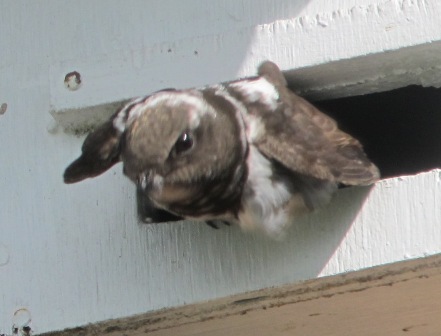 This is interesting because in this case at least the female has selected the nest site. In fact she did this back in June 2010, quietly prospecting alone. 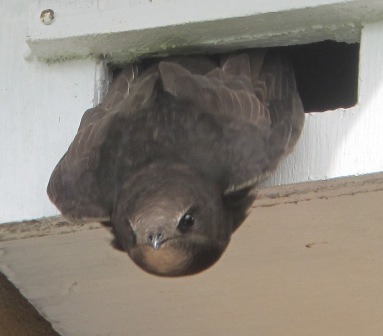 She arrived on 11th May this year and has roosted in the box alone every night, but will she be alone tonight? Watch this space. 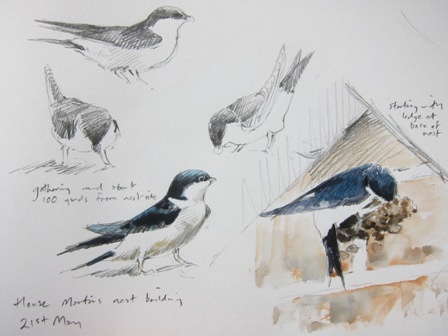 Two pairs of House Martins have started nest building on the house. After several days of singing and chattering loudly from dawn every morning they have made their decision and are adding mud pellets. First they build a substantial shelf about five inches from the soffit board. This will support the side walls as they progress. Once they have built a substantial foundation they will start roosting on it. 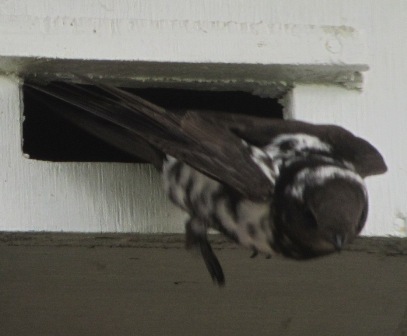 I love the sound of martins and their graceful flight as they approach the eaves. They are collecting mud from a puddle about 100metres from the house but have been delayed over the last two days by the strength of the wind. At least the rain will have topped up their mud supply. Anxious Lapwing and Avocet parents were on one of the pools at Cley. 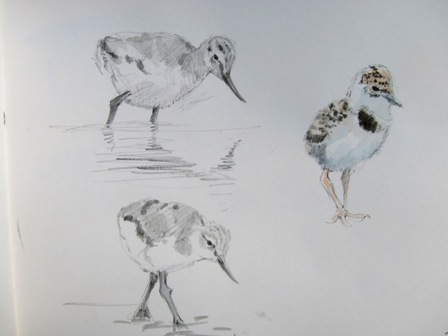 The Avocet chicks were venturing out into the open shallows to take flies from the surface of the water, whilst the young Lapwings fed in cover around the edges of the water finding insects at the bases of grasses. In each case the parents were nearby, constantly watching their broods and immediately taking to the air as potential predators approached, ready to call the alarm to take cover. This time last year I watched a whole brood of three Avocets about this age swallowed one after the other by a Grey Heron. An inspiring trip to Cley, Norfolk yesterday found me laying at the bottom of the shingle bank, telescope trained upwards. Feeding near the top of the bank there was a pair of Shore Larks, one of my favourite birds. They were feeding up ahead of their journey back to to the tundra of Norway and Finland. Above them, sometimes by only a few feet, was a constant procession of westward bound migrating Swifts which were following the coastline, some flying above the sea. 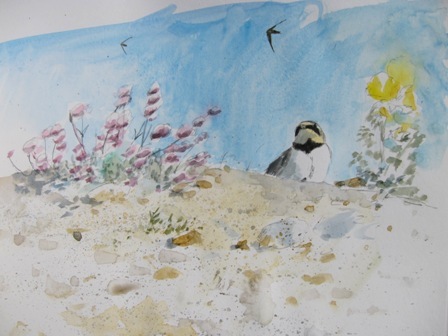 One of the great joys of natural history is the element of surprise- I would never have guessed that I could sketch Swifts and Shore Larks at the same time. The Shore Larks were feeding on bladder campion flowers, I would imagine they were taking the forming seed. With a deep cerulean blue sky the pink of bladder campion flowers, yellow poppies and the shingle itself made a superb setting for these delightful larks. 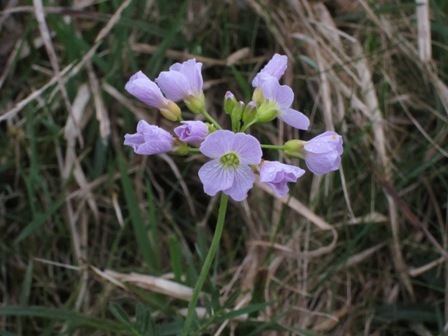 Spent a showery morning in the Dales yesterday looking at flowers of limestone grassland. 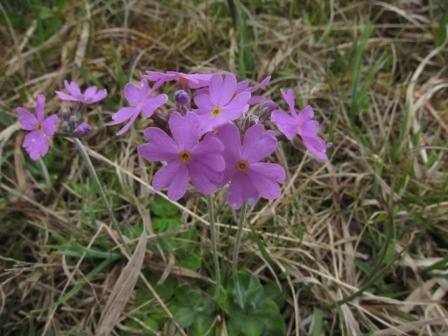 The Bird’s- eye Primrose is a Yorkshire and Cumbria speciality and surely one of most delicate and beautiful wildflowers. 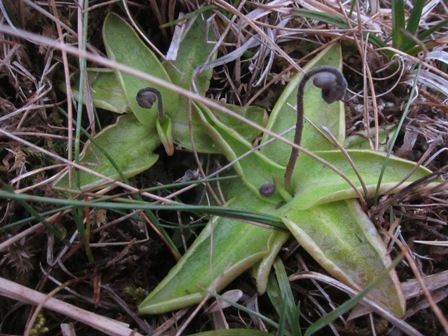 Common Butterwort catches flies which it then devours with its sticky leaves which are arranged like a lime green star. As the insect struggles it triggers the leaves to roll up. As I studied the flowers the dale was filled with the sound of Oystercatchers and Common Sandpipers, both of which breed by the river. 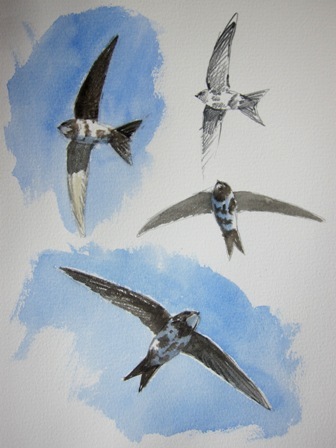 Yesterday morning I was delighted to see a Swift I came to know very well last year. 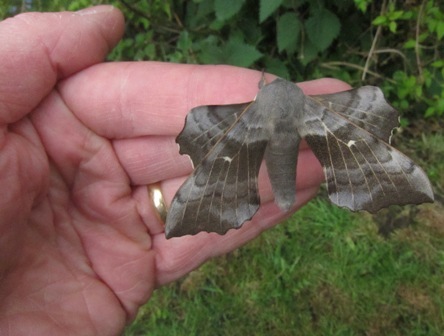 It first arrived over our house on May 27th 2010 and entered Swift box 3 several times around mid June. 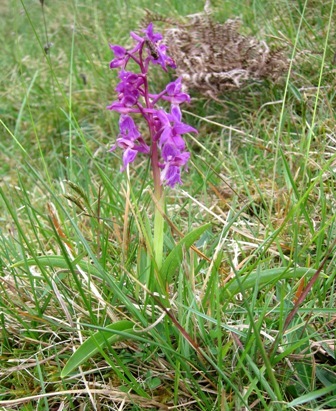 However it did not attempt to breed but stayed around the village and in particular around our house until August 7th. 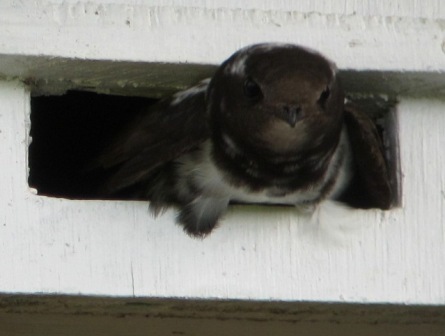 This Swift offers a unique opportunity to study the behavioural patterns of an individual. 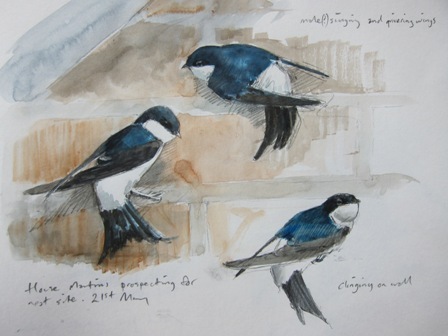 Yesterday morning it was seen entering Swift box 3 and it returned at 8.52pm to roost there. It will be fascinating to see whether it remains here to breed. We know that many of the Swifts we see will have been here last year but to recognise one really fills with wonder at the sights it has seen over the last nine months, the dangers it may have encountered, the spectacular thunderstorms it may have witnessed in Africa. Getting to know an individual bird and welcoming it back after its amazing journey is a huge priviledge. 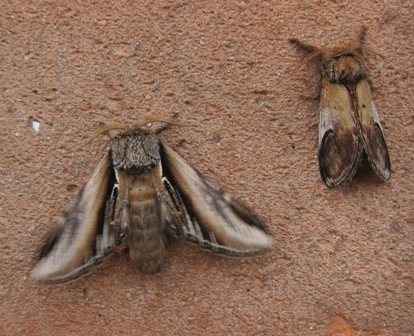 Some more spectacular but widespread moths caught this week. 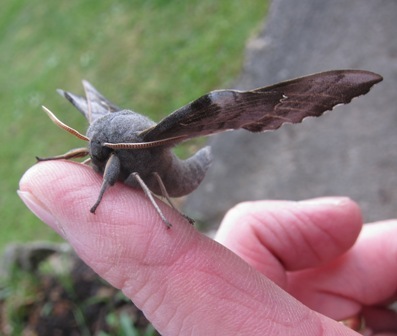 The Poplar Hawkmoth is the most widespread hawkmoth of the British Isles.